Do you love bacon, chocolate and coffee and you're not afraid to show it? Or maybe you know someone who loves bacon, chocolate and coffee. Each of these things alone can be considered givers of life force. Together their alliance is even stronger! Chocolate bacon and coffee... What a way to start the day! This bundle includes a gift boxed 3 ounces of premium quality gourmet hickory smoked bacon that is cooked then delightfully and decadently covered in dark chocolate. The sweet chocolate coating and the smoky salty flavor of the bacon mingle in your mouth, complimenting one another like ladies at lunch! Now take a whiff of your freshly ground maple bacon coffee beans as you brew a cup. What a way to celebrate National Bacon Lover's Day. 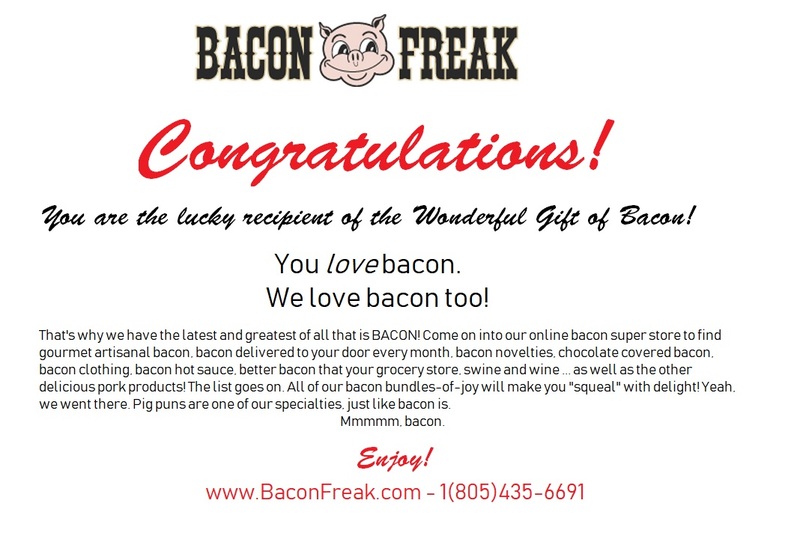 Also included is a magnet and a bumper sticker professing your love of bacon. Be sure to display these prominently when nearing your birthday or holidays as a subtle hint.